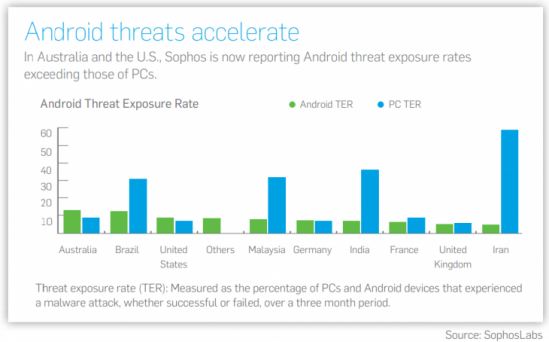 In its latest Security Threat Report 2013 (via The Next Web), Sophos declares 2012 the year of Android and Mac malware, as cybercriminals have targeted new platforms with modern malware, especially targeting Android, but Mac OS X is also among the new targets. With Android being the most popular mobile operating system, it’s obvious that it is the cybercriminals’ biggest target these days. To name a few examples, Sophos has pointed to Android malware that installs fake apps that send expensive messages to premium-rate SMS services, right in line with McAfee’s recent findings. The chart below visualizes the growth of Android malware compared to PC malware. As the number of Mac OS X users grows, the risks are also on the rise, at least from the perspective of a security company such as Sophos. 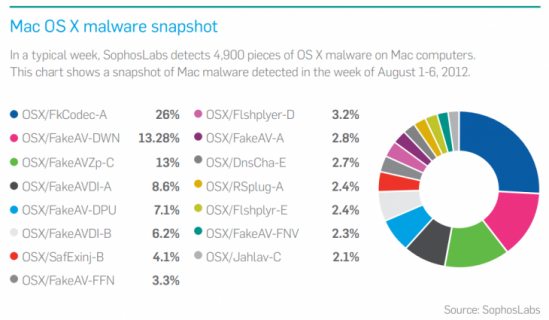 In its report, Sophos reminds us of Flashback, the Mac malware infecting hundreds of thousands of Mac computers. 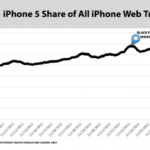 What they would like to emphasize here is the rapid growth of Mac malware, which is becoming more sophisticated, the security company’s report states. Here is a chart that visualizes the growth of Mac OS X malware. In addition, Sophos paints a dark image of next year’s security: it expects the currently available traditional business security systems to fail, and, as a result, a rise in successful attacks against corporate networks.